London currently seems to be awash with epic plays that sail well over the three-hour mark. 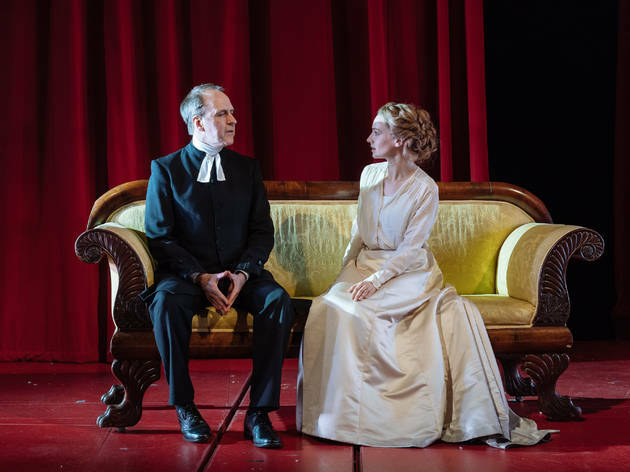 And like the National Theatre’s gargantuan ‘John’, ‘Pride’ writer Stephen Beresford’s adaptation of Ingmar Bergman’s 1982 film masterpiece justifies its hefty run time. Unlike ‘John’, ‘Fanny & Alexander’ heaves with incident. It’s a borderline magical realist interrogation of human morality that follows the eponymous early twentieth century Swedish siblings – though mostly the older, angrier Alexander – through a tumultuous period in their lives. In it, they go from cosseted scions of a troubled but loving theatrical dynasty to suffering at the hands of their monstrous stepfather, Bishop Edvard Vergérus. Max Webster’s heady production is not flawless, but it’s a pretty tremendous achievement. The first part is the flimsiest, set in happier times before the children’s father’s death. 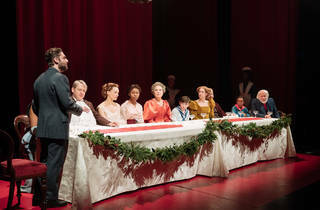 It’s full of metatheatrical japes – Alexander brazenly comes on at the start and declares that this will be ‘the longest play in the history of the world’ – food porny descriptions of feasts and an eccentric sea of relatives, presided over by Penelope Wilton’s stately, steely Mrs Helena Ekdahl. But there’s a darkness there, both in the Grim Reaper of little Alex’s fantasy and the obvious faultlines in his parents’ marriage. It ends with a gorgeously oppressive, snowswept funeral scene, the first of several remarkable tableaux from designer Tom Pye. The most haunting comes in the phenomenally good second act, in which the Bishop’s desiccated household swoops in from the dark to replace Fanny and Alexander’s vibrant old life with a bleached wooden corpse. This clash between the jaded acting dynasty and the Bishop’s joyless, spartan household is the most thrilling bit of the play. It’s never in doubt that we should root for the former. But Bergman and Beresford’s characterisation is at its most complex and entertaining here. There’s something malevolently Dickensian about the Bishop and his family. But we see that the man has been shaped by tragedy and self-loathing, and Kevin Doyle is excellent in the role, imbuing him with a plain spoken, down-to-earth quality that resists panto villain excess. Meanwhile the children’s mother Emilie (Catherine Walker) recognises the magnitude of her mistake in marrying the Bishop almost immediately. But we see that it was a sort of self-indulgence that led her to do it in the first place, an idle fancy that perhaps this man’s monstrous drive might give her direction too. Things get increasingly fantastical in the final act, full of magic and death. It’s wild and surreal, the most indulgent part but also the most thrilling – rather than follow the usual rules of tragedy, catharsis and happy endings, ‘Fanny & Alexander’ kind of blows its top in a satisfyingly elemental fashion. 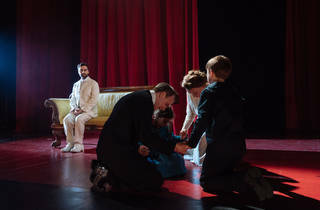 While Bergman’s even lengthier original film successfully gave the sense of a strange world viewed through small eyes, here Fanny and Alexander feel comparatively downplayed as characters, perhaps for fear of laying too much on a rotating cast of child actors. 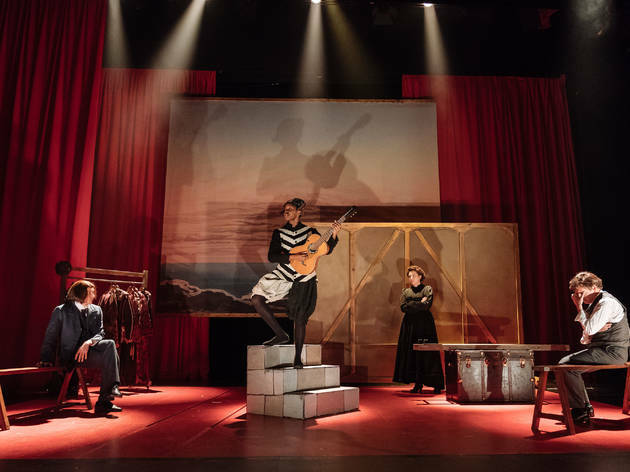 There was an excellent turn from Misha Handley, who played Alexander on press night, but it doesn’t quite feel like his story, more a grand, phantasmagorical melodrama in which he plays a significant role. 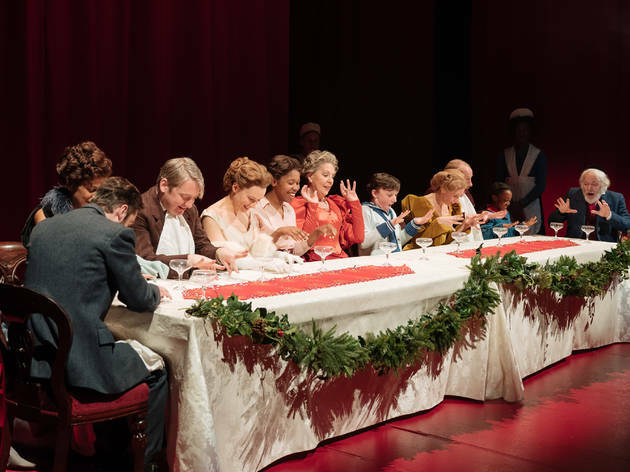 It’s an unusual show in many ways, but steadied by a first rate cast, I think we can call it one of the more successful creations of the Matthew Warchus regime at the Old Vic. It’s not always subtle, but it’s possessed of a surging emotional swoop and visual audacity that bursts its way into your heart. Yes, this is a very long play but the time passed in a blink. What a fabulous production. worth every minute and every penny. This adaptation of the 1982 film, is set in Upsala in the early 1900s. The large, theatrical family start to take us through the seasons until the untimely death of Fanny and Alexander's father. Emilie (Catherine Walker) is now a widow and while she questions her life, Alexander questions why he sees dead people and the Grim Reaper himself. Emilie's re-marriage to the bishop ( Kevin Doyle), is a catastrophe almost from the start. This new spartan life is in well-defined contrast to her former life. Plans have to be hatched to get her children and herself out of this toxic situation. 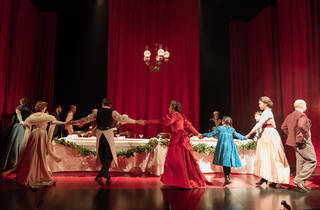 There are moments of wonderful choreography, whether surrounding feasting or removal of elements of the set. The acting is all round laudable.. You only have another week. Quick! The “longest play in the history of the world” (as Alexander’s first line in the play meta-presents it) is a fine play, but definitely too much for people who are truly interested in theatre (not just the story and acting, but costume and set design, art direction, etc.) 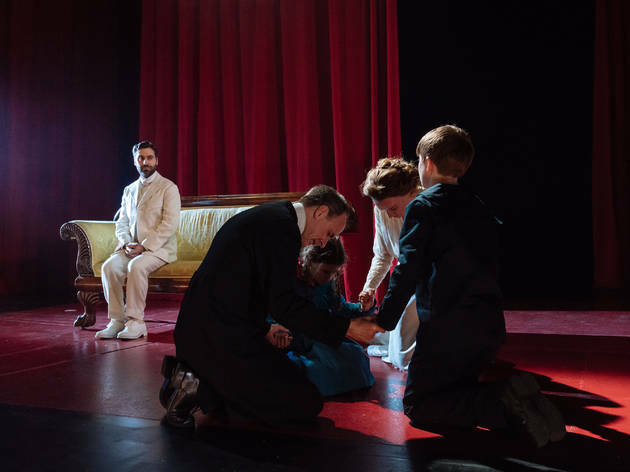 Each act could almost work as separate plays: a comedy in the first act, as we’re introduced to the theatre family of Fanny and Alexander (the children) – you can feel the drama getting in there, but most of it is just funny interactions and character ‘portraiture’. 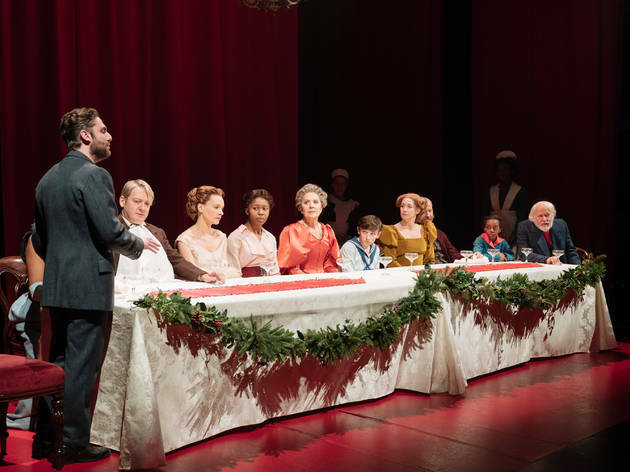 The second act is a truly heavy drama, Dickensian as Time Out reviews puts it, when the children’s mother remarries a severe and hostile minister. The third is comedy, drama, adventure and magic (if it sounds excessive, that’s because it is), where the theatre family works on rescuing them from the minister’s house. I echo others' sentiments that this play is just too long, in my opinion the scenes could have been cut down quite a bit and the show would have still been interesting. I am a big fan of the movement pieces in this play, I just wished that some of them (the mimed dinner section) were more slick and in sync. The acting is great and it's nice to see some child actors who can actually act, but the story tends to drag. Penelope Wilton is hilarious but I don't think she's in it enough to be the only actor to have her name on the poster ('celebrity' draw and all that). All in all an enjoyable evening, with some funny bits, but not enough to be memorable. I actually really enjoyed this play. 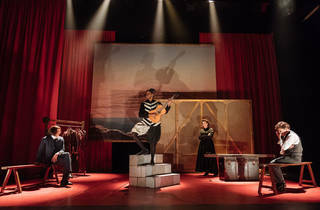 I agree with other reviewers' comments that it was too long, however I thought the acting was superb, the storyline interesting, the set and props very impressive, and the overall experience very different to other plays that I have seen in London. I have to admit I did feel confused at the end about what had actually happened, but I found myself thinking about it for days afterwards, which is the sign of a good play for me. I'd recommend it if you're in the mood to see something a bit different (and you don't mind a late night!). I have to echo everyone's sentiment. Acting was great, and I enjoyed the minimalist scenery, but good god it was too long. I think if they cut an hour it would have been fine. I still don't understand why its called 'Fanny & Alexander'... it revolves around the kids... KINDA?! I did enjoy the dry witty humour, and again that comes out beautifully by the actors who play the characters. Eat before you go see this, you don't get out until 10:30ish... meaning your choices nearby are more fast food focused. This all being said, I am intrigued to see the film because I want to see if I missed something? I have to say I wasn't overly impressed with this piece. With such a long running time, I expected a bit more unique and innovative elements - like the decor or playing with immersion... Something like that. Unfortunately it seemed all tricks were very common ground. The storyline is exciting and the acting phenomenal. But it's not enough to save the play in my opinion. Ventured out during the Beast from the East to see this. Three hours is a very daunting length for what is neither terrible nor spectacular. I wasn't gripped by it. It was just a story about a dysfunctional family. I'm not a fan of that genre. The set changes were clever, there were a few dialogue mistakes as the actress must be more comfortable on tv where there are retakes. Not the plays fault but the seats were uncomfortable and by the first interval I could barely stand up. We wouldn't have missed some of the play and it could have been cut to shorten it to a comfortable time. Dark shaded, beautifully played and definitely engaging, this play won't disappoint you. But won't amaze you either. 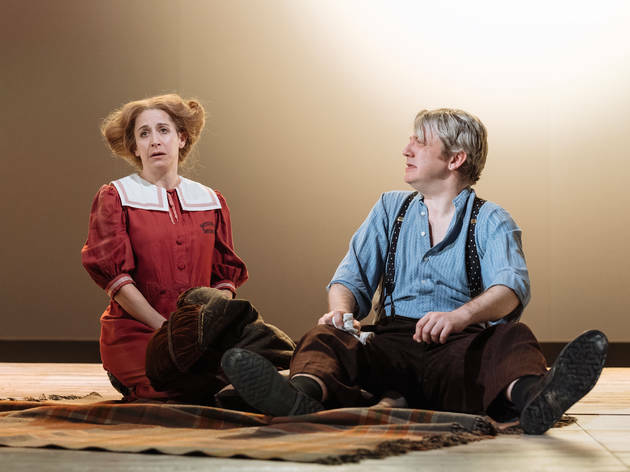 Despite the brilliant acting of the children, the richness and variety of the different characters and the depth of the themes, this play doesn't bring anything particularly new on the stage. It is a traditional play, very well performed and touching and deep, but I don't think the plot itself is particularly outstanding. Apart from the length, which I didn't mind, the rhythm of the play was sometimes too slow and made me loose interest. Still worth the price if this is the kind of thing you are looking for though! The cast is really great and I liked the Scandinavian vibes and unsetting atmosphere it creates. Fanny and Alexander is a journey in a lot of sense. It's a journey, because we can follow years of a wonderful family's life; it's a journey because the beautiful sets immerse us and fly us to different locations and it's a journey because of it's length. The story was engaging,but because of the play's length I had ups and downs with it. I found the characters interesting and loveable and enjoyed the unfolding drama, but at the slower and longer scenes I found myself a bit bored. The acting was fenomenal. I don't think I've seen cast where every member acted this sensitively, beautifully and truthfully. I was blown away by the talent and professionalism of the child actors. I loved the set design, it was clever, eye-pleasing and satisfyingly minimalistic. Overall Fanny and Alexander was a great experience with amazing acting and engaging storyline...if only it would be a bit shorter. Although the length of this performance is understandably polarising, I believe you'd be hard pushed to find anyone who didn't agree that you really are getting your money's worth with this performance and not simply because of its bold running time. The ever-shifting set design is some of the best that I've seen in a few years, the costumes and characters were enchanting and the acting was fantastic across the board. This is a surprisingly dark tale, laced with comedy throughout. It's not a show I would be rushing back to see but I was impressed enough that I'll be the first in line for The Old Vic's next production! I think you’ve all read it multiple times, but I must go with the masses and mention that this performance is long! Running over three and a half hours with two intervals, it is a commitment, especially on a weeknight. Despite the length, it is a fantastic performance of family, love, loss and recovery. My ah! 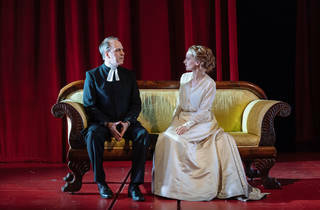 Moment was when Kevin Doyle (recently from the Happy Valley fames) walked on stage as Bishop Edvard Vergérus. While the focus of the story are two young siblings, Frank and Alexander, the play has a few dark and twisted moments that make the performance intriguing and interesting. With such an epic run time I was expecting a night full of wonderful story telling and epic scenes however after the first 30 minutes I could sense myself losing interest. There’s a lot to see but, in my opinion, not a lot happens which would be fine if I felt the story of this frankly ordinary family provoked and or addressed something bigger, it didn’t. It’s essentially a story of a middle class theatrical family going about their lives, they encounter death, adultery laughs and crys… but doesn’t everybody? If they were trying to portray something bigger I certainly missed it. The cast however were fantastic, with Kevin Doyle’s disturbing bishop the highlight for me. He comes into his own during the final act, but again I felt the story telling missed a beat by not exploring his character more or digging into his past. Again maybe this play completely went over my head, but the naturalism style mashed with some quite confusing scenes wasn’t my cup of tea. This was my first play I had been to and I was super excited for it. As soon as I got there though, I was immediately put off by the length of it.. 3 and a half hours is just far TOO much for anyone to digest in one sitting.There were elements of Fanny and Alexander I really enjoyed though, the child actors were brilliant, the costumes were well made, the set was very smooth and some of the dialogue between actors were very funny. I didn't like the fact there was so many unnecessary scenes to the point it became confusing and stuffy for such a simple story line. I don't regret going, and the message of the story is heartwarming, but overall it was just too long. Fanny and Alexander is a play to luxuriate in. Sit back, relax and let three and a half hours of rich storyline, beautifully performed, draw you away into another world. Don't feel guilty about it, for as the moral of the tale has it - it is good for the soul to give in to pure pleasure occasionally. The acting in this show is a wonder to behold, full of larger than life characters, there is never a hint of pantomime or showboating. 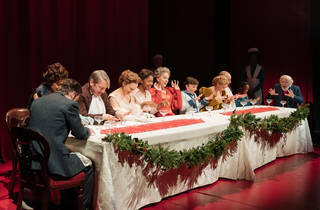 The play (and audience on the day I attended) was crammed with the best actors that London has to offer. Penelope Wilton is amazing as the matriarch with a past, holding the family together. Jonathan Slinger is excellent as a slightly sleazy but unapologetic sybarite. Kevin Doyle brings out the best (and worst) in the ascetic bishop. Michael Pennington is fabulous as Isaac, the puppet master bringing the action together, seemingly from the periphery, but not as detached as he appears. Guillermo Bedward played Alexander in the show I watched and he was very good, both funny and serious. 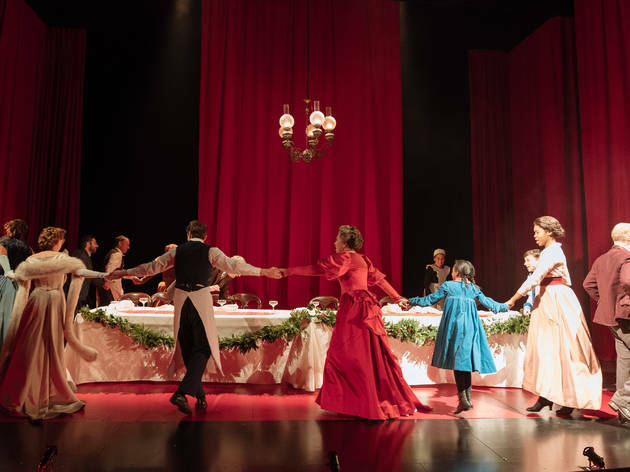 Go to Fanny and Alexander to be transported, to indulge in a feast of excess, to wallow in an evening of rich extravagant entertainment and just enjoy the enjoyment of watching great theatre unfold before your very eyes. I loved this show and I don't feel guilty about it, it was one of the most rewarding afternoons that I have ever wasted! 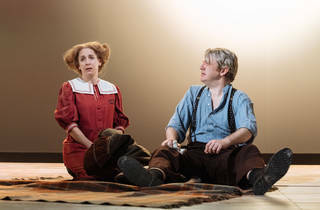 The play itself even pokes fun at it's lengthy run time at the very beginning so you would hope not to be conscious of the length of it but really it is the defining feature of the performance. With this in mind barely 20 minutes in I couldn't help but wonder at the relevance of certain scenes and particularly lengthy dialogues. That aside, and it is difficult to put it aside, I did enjoy watching the performance. The story is thought-provoking though at times disorientating and confusing but the acting is superb, especially from the children, and the cast is very impressive. Having not seen the film I'm not sure whether the confusion I felt during certain parts ('is this supposed to be real or is it, like, a metaphor or something...?) 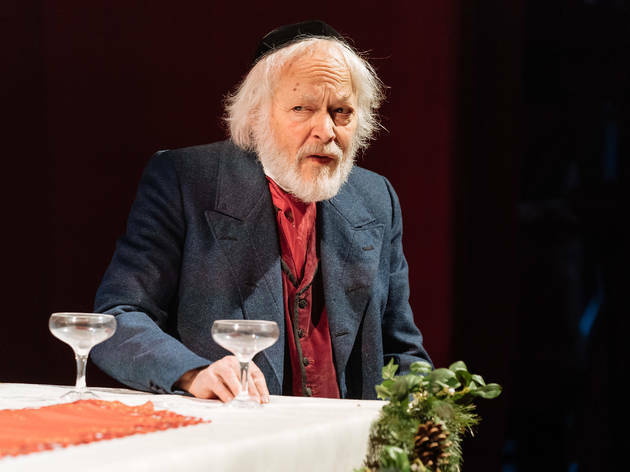 is true to the original or not but it certainly provided a conversation starter during the two intervals which, though necessary given the length of the play, did feel a little frantic given that they were only 15 minutes long. I know if they were longer we probably would have been at the theatre until around 11pm or later but it did leave us having to make the important decision between a trip to the bar and a trip to the bathroom! Overall it's not something I would rush back to see but I don't feel like I wasted 3.5 hours of my life, though I do feel like it didn't need to be 3.5 hours of my life. Despite the name, the play wasn't much about Fanny and Alex - the arc is on their mother. We were nervous after realising the length of the play, which we were watching after a long day at work. The first act is off to a slightly slow start, except the lavish Swedish Christmas dinner, we only heard the dishes being announced but man did that sound amazing. By act 2 & 3 we were at the edge of our seat and didn't notice the time go by at all. A few scenes are definitely standouts - how the barren, stark home of the bishop is revealed and loomed over you. The scene where you meet Ishmael (callout to cool gender mixing here too). And really fantastic performances from the grandmama and the bishop. The central theme of the story reminded me of my favorite Swedish word - lagom - "just right" - a word used quite excessively as a response to any question, where it's not about things being too hot, or too cold, or being great, or terrible, or different. It's being content with how things are, as they are. Much will be made of the show’s 3hr 30min run time (with not one, but two intervals!) by others, so it seems unnecessary for me to dwell on it too. However, the epic run time unfortunately isn’t matched by the show’s rather simple story. At its core this is a tale all about family. No matter how dysfunctional yours may seem, you don’t know what you’ve got til it’s gone. 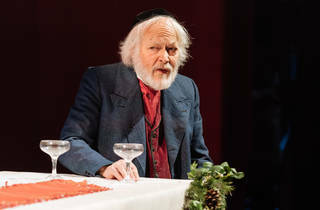 There are some standout performances from Misha Handley’s potty-mouthed Alex and Penelope Wilton’s Grandmama, but it’s Kevin Doyle’s intensely dark bishop that steals the show. Personally I quite liked the play being cut into three 60 minute(ish) acts. Each has a different backdrop, none overstays their welcome and the two intervals gave a chance to reflect on what happened or what could happen next. However, its epic run time is let down by a simple story. In short (a phrase one wouldn’t expect to hear when talking about Fanny and Alexander), it takes a long time for not an awful lot to happen. I really wanted to like it, and I feel bad.....but I didn’t. It was too long with some really unnecessary scenes. It’s never a good sign if you’re not sure you want to stay past the interval. The actors were very good, with cool set changes and nice costumes. However, I found it to be very boring and expected and out of season if I’m honest. I might have felt a bit more inclined around Christmas time. If you know the story and like it, it may be worth checking it out but I wouldn’t recommend splurging for the expensive seats on this one.